Summary: Its poor showing at the American box office last year shows that audiences know it too, and demand better. Loosely rooted in a classic Japanese comics series, Astro Boy is an animated tale set in that future that currently seems to be the only conceivable one for filmmakers, in which earth’s environment has been destroyed and humans have set up a new society; in this case a city that hovers miles above the abandoned surface. The film’s stylized opening lays out the rules of this robot-assisted world, but while it’s a cute little sequence you may find yourself zoning out before the story proper has even begun, as the set-up is so clearly a primary-coloured version of a scenario we’ve seen many times over the last decade in everything from I, Robot to WALL-E. The boy of the title is a supercharged version of the service robots that populate this world, created by the government’s chief weapons and robots specialist, Dr Tenma (voiced by Nicolas Cage). 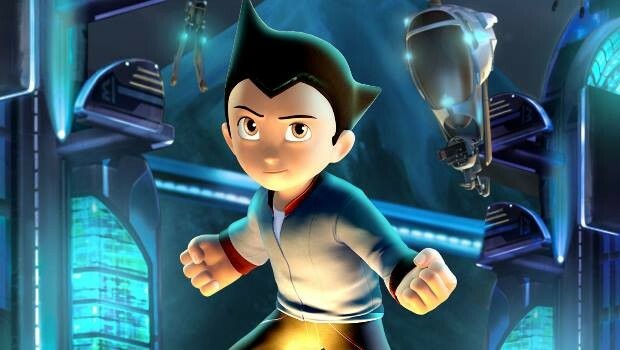 Tenma builds Astro Boy (Freddie Highmore) as a robotic replacement for his son Toby, who is tragically killed after sneaking into one of Tenma’s weapons testing experiments. The inventor soon realises that the robot can’t replace his son though, and kicks Astro Boy out of his house. Meanwhile, war-crazy President Stone (Donald Sutherland) wants to get his hands on Astro Boy’s uniquely powered robot heart to bring a massive weapon called The Peace Keeper to life. Astro Boy finds his way down to earth’s surface and joins up with a band of resourceful orphans, hoping to find his place in the world and stay out of Stone’s clutches. It’s ironic that Astro Boy’s story is rooted in the concept of uniqueness and invention, as director David Bowers (Flushed Away) has failed to come up with a single original idea in his telling of it. Instead, he steals visual and thematic concepts from wherever he chooses and piles them up with no foundation, leaving his film with zero integrity. The basic story is obviously reminiscent of Pinocchio and Speilberg’s A.I, but these two films come with serious philosophical baggage that Bowers simply attempts to ignore, unsuccessfully. You can’t introduce a robot character in the image of a dead human and just assume that the audience is immediately going to love and root for it. Pinocchio wanted to be a real live boy, so that’s an easy motivation to root for. But Astro Boy wants to be loved, and Bowers gives us no good reason to love him. He’s just a hunk of metal, and I’m still mourning the poor dead kid from the beginning! Maybe Bowers watched WALL-E and was fooled by how easily Andrew Stanton seemed to transfer human emotions and soul-searching to a robot character. If anything, Astro Boy proves that’s much harder than it looks. The same is true in the action stakes; all the big action beats in Astro Boy are direct rip-offs of the huge fight sequences from Iron Man and the Transformers movies, and have none of the wit or visual invention of Monsters vs. Aliens, last year’s Dreamworks hit that perhaps represents the kind of tone Bowers was actually going for. What he ended up with was a hugely problematic mess. The script, by Bowers and Timothy Harris (who in a previous life was a co-writer on 80s comedy classic Trading Places) is dire, peppered with weak political jokes that kids won’t get and adults will find patronising. The writers’ only conclusion appears to be that violence solves everything, and arms that can turn into cannons are way cool! To top it all off, the film contains the least convincing voice acting I have ever heard, with Cage in particular sounding like he’s been recorded at a script read-through, prior to being given any direction. The swelling of the nominees list from three to five for this year’s Best Animated Feature Oscar confirms the level of quality that animated filmmaking has hit in the past year. Astro Boy has no place in a movie landscape that is producing genuine classics like Up and Coraline, as well as lower budgeted gems like The Secret of Kells. Its poor showing at the American box office last year shows that audiences know it too, and demand better.